In the video below, Dr. Stan Harltzer is interviewed by Peggy Venable. Dr. Hartlzer received his Doctorate in Mathematics from The University of Texas and taught algebra in the Luling public school system among many others for over forty years. I have personally spoken with Dr. Hartlzer and he relayed to me his frustration with the CSCOPE method and lessons. He explained that the CSCOPE curriculum as it pertains to algebra, is like building a skyscraper but the first two floors are missing. The fundamental building blocks necessary to understand and then move on to higher algebraic equations are just not there. He lamented that his students, while perfectly capable of learning and excelling at algebra, were losing confidence in themselves and thought that they were incapable of learning the material. Dr. Hartlzer started tutoring the students with material not found in CSCOPE that included this crucial information and he said that the students were actually excited to learn that they weren’t incapable at all. He also said that their confidence level in themselves could be seen right away. You might want to read and listen to that part more than once and let that settle in for a moment. 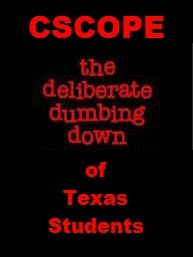 Could CSCOPE, Project Based Learning, Tranformational Education, Common Core, etc. really be that evil? Would this system of “education” really want to take us back to the day when we hid education from certain genders or races of people to keep them in their place? I’ll let you be the judge but there is no escaping the fact that these changes in our educational methods and instructional materials are in fact dumbing down our students day after day. Examples are no spelling programs, no handwriting drills and on and on and on. This criticism of CSCOPE, cannot be easily ignored by claiming a bias held by us as has been attempted by various CSCOPE supporters in the past. Mathematics has no bias or political agenda and as such leaves little room for such claims. Dr. Hartlzer’s perspective on CSCOPE in the video below should alert all parents. Texas teachers have to anonymously alert us to what is happening in the Texas public school system. Below is an email sent to Donna Garner in reference to the CSCOPE English program. My district is a CSCOPE district and has been for several years. Today we had an elementary English teachers’ meeting with around 50 people in attendance. A visitor from the community attended. Evidently he is now teaching at a private school but had been a public school teacher previously. During the discussion at the end of the session, the facilitator was asked by the visitor what spelling program we used. The facilitator said, “None. The district has no spelling program because the principals have said spelling instruction was not necessary.” The visitor said that spelling should simply be a means of testing how well the students were learning the English orthographic system (phonics). He said that the words that kids can spell are read fluently and that the best way to improve reading fluency was to teach spelling. Several of the teachers in the group agreed but said that their administrators had other ideas. The visitor then went on to say that good, legible handwriting was a powerful tool for teaching kids to spell better. Everyone nodded. Then he asked, “What handwriting program do you use?” We replied, “None!” The visitor stated, “Well, I was just told by a previous facilitator that you have an embedded handwriting program in your Guided Reading program.” That brought a round of derisive laughter from the group. The visitor then mentioned that the kindergarten kids at his school all wrote fluent cursive and were able to write the entire alphabet from A to Z readily. We were amazed. The visitor continued on and mentioned that none of the kids coming to him from the public schools knew how to hold a pencil properly or write their letters correctly. The visitor, seeing the amazed response from the rest of us, suggested that they need to get the Zaner-Bloser handwriting program which would solve all their problems. After the workshop was concluded, several of us teachers gathered around him as he showed us the Zaner-Bloser method for teaching fluent cursive. After a few minutes of instruction, several of us said we had learned more about how to teach cursive handwriting with him in less than 10 minutes than we had learned in all our years of teaching. We all indicated to him how unhappy we are with Guided Reading and the lack of handwriting and spelling instruction. The visitor went on to say that when he was a public-school teacher, his second-grade, bilingual students wrote 3,500 words and 600 sentences in his phonics-based reading, cursive writing, and spelling program. We told him that we had no time to teach spelling and handwriting because we have to get kids ready for STAAR. He said that was backwards because kids need to know phonics, spelling, and handwriting to be able to score high on the STAAR. He said that with kids floating around from workstation to workstation all day long, there would be no time for direct instruction. I have to admit that the visitor made so much sense, and now I know why out of 38 campuses in our district, not one of them received a Distinction in Reading/ELA on the STAAR/EOC tests. We had one only campus that received a Distinction in Math, and no campuses were awarded Top 25%. PLEASE NOTE: CSCOPE has a new name, TEKS RESOURCE SYSTEM beginning August 30th. Changing the name, however, does not change the curriculum. See here for an article about the name change. This entry was posted in Cscope, Education, Texas Education. Bookmark the permalink.